Hosting an event can be a lot of work. Thankfully, there is an impressive catering scene in Nebraska to make your life a bit easier! Whether it’s a wedding or corporate event, Nebraska is home to a wide variety of caterers with extensive, fresh menus tailored to your needs. So the next time you’re planning a party, be sure to check out these 10 best caterers in Nebraska. Whether it’s for 100 or 1,000 people, Attitude on Food in Omaha is one of the best caterers for big events. Their professional and streamlined services will accommodate all of your party or event needs and high quality dishes are guaranteed. Greta’s Gourmet in Lincoln provides chef-quality meals for parties and events from two to 500 people. This award-winning caterer offers the freshest dishes created by trained chefs for any event—whether it’s a wedding, luncheon, or private dinner. Runcie’s Catering in Hastings makes any celebration, big or small, one to remember. 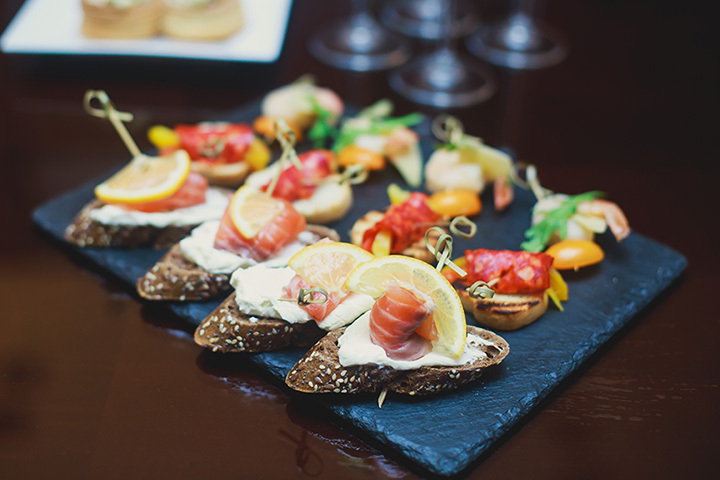 With catering options to fit all tastes and budgets, Runcie’s will handle all of the logistics and details so you can sit back and enjoy your special occasion with peace of mind. Eddie’s Catering in Omaha offers made-from-scratch dishes that are both healthy and delicious. The family-run catering company has been in business since 1951 and also offers catering at one of their two dining halls to suit your event needs. Wunderlich’s Catering & Barley Shoppe is a family business that started around 1908. This caterer serves the Columbus area with great home-cooked food and excellent, professional service. With a Barley Shoppe under the same name, they also offer a wide selection of liquor, wines, and beer to celebrate any occasion. For over 16 years, Country Pines in Lincoln has dedicated themselves to providing customers with the best catering services. Not only is everything made from scratch from the freshest and finest ingredients, but they also offer a unique venue overlooking a vineyard for events of all sizes. Abraham Catering in Ralston offers an exquisite line up of menus and meal packages. From custom-designed menus to four-course meals, Abraham is well-equipped to handle events of all sizes and tastes. For affordable and unique dishes, Catering Creations is one of the finest caterers in Omaha. In fact, they’ve won Omaha Magazine’s “Best Caterer” six years in a row! Annette’s Catering & Specialty Desserts has been operating for over 10 years and offers catering services to many cities in Nebraska for weddings, graduations, private parties, and more. The best part about Annette’s is the extensive desserts menu—there are over three pages of delicacies to choose from! From a baked potato bar to lavender-infused dishes, Chez Hay is one of the most unique catering options in Nebraska. Furthermore, if you need a space for your event, Chez Hay offers a beautiful space in downtown Lincoln with striking views for the perfect ambiance.